The Campania region is characterized by three large volcanic areas: Vesuvius , Ischia and Campi Flegrei. Vesuvius, the most dangerous active volcanoes in Italy, is worldwide known specially for the eruption of AD 79, which interrupted a period of inactivity of seven hundred years and in two days destroyed the cities of Pompei, Herculaneum, Stabia and Oplonti. 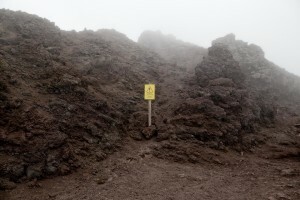 Just west of Vesuvius, less than 15km from its slopes, a series of hills with a maximum elevation of 460m above sea level hides a far more serious danger. 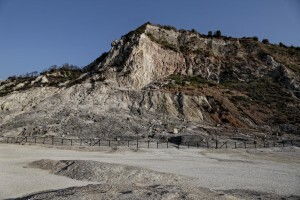 It is the volcanic area of Campi Flegrei, one of the ten supervolcanoes in the world, known for the phenomena of the soil lifting’s, called bradyseism, which always afflicts the town of Pozzuoli, and came to prominence in the 80s, precisely between 1982 and 1984, for a seismic crisis which brought down the entire area causing the evacuation of thousands of people. 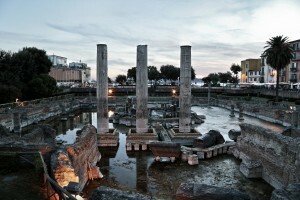 A tool used for the detection of bradyseism were in the past, the pillars of the so-called Temple of Serapis at Pozzuoli (the ancient macellum), which until 1983 were partially submerged by the sea, and now find themselves above the sea level. The three marble columns showing the highest lithodomes hole up to a height of 6.30 m from the base of the building, level attesting the highest bradiseismic submersion undergone by Campi Flegrei in medieval times. 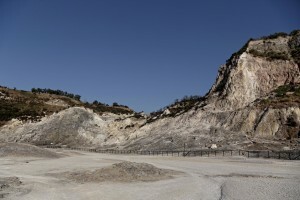 The Solfatara of Pozzuoli is one of 40 volcanoes that make up the Campi Flegrei and is located about three kilometers from the city center of Pozzuoli. It is an ancient volcanic crater still active but in quiescent state, known for about two thousand years for its manifestations of sulfur vapors at a temperature of 160 ° C , emissions of carbon dioxide and boiling mud volcanoes. 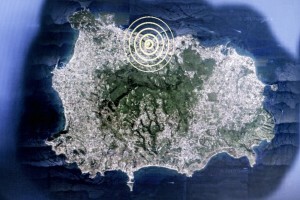 The island of Ischia is a volcanic field that probably in the past was much more extensive. Volcanic rocks on the island are the product of both effusive and explosive eruptions. 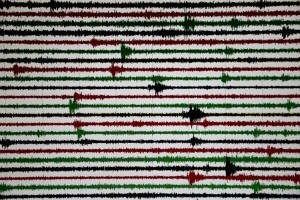 It is currently the Vesuvius Observatory which deals with the geophysical and volcanology research and its application to the monitoring of active volcanoes in the Campania region and the rest of Italy. 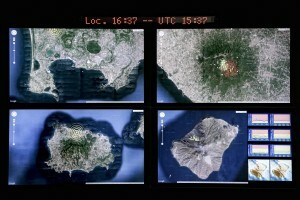 The Vesuvius one, is the oldest volcano observatory in the world. 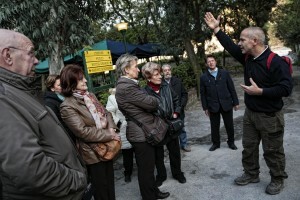 Its foundation dates back to 1841, by the King of the Two Sicilies Ferdinand II of Bourbon. 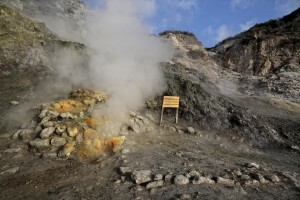 Fumaroles emerge from the Solfatara crater in Pozzuoli, Italy on April 12, 2014. 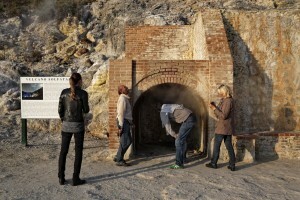 Fumaroles are volcanic steam releases that contain sulfur causing a malodour similar to addle eggs. 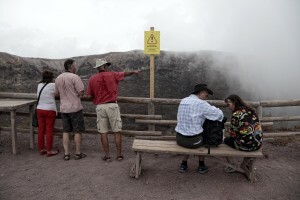 Tourists visit the Solfatara volcano from which emerge fumaroles in Pozzuoli, Italy on April 12, 2014. Fumaroles are volcanic steam releases that contain sulfur causing a malodour similar to addle eggs. 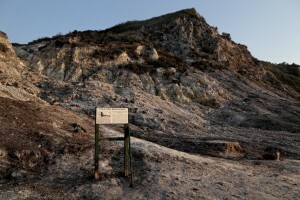 A general view of Solfatara volcano from which emerge fumaroles in Pozzuoli, Italy on September 2, 2013. Fumaroles are volcanic steam releases that contain sulfur causing a malodour similar to addle eggs. 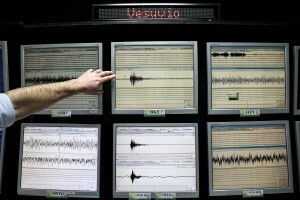 Monitoring room of INGV (National Institute Geophysics and Volcanology) Osservatorio Vesuviano department which constantly monitors volcanic activity of mount Vesuvius, Campi Flegrei, Ischia island and Stromboli island in Naples, Italy on March 19, 2014. 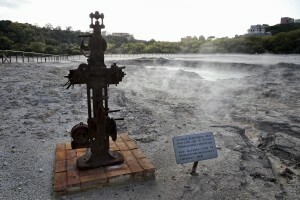 An old machine used to package the solfatara’ s thermal mud inside solfatara volcano site in Pozzuoli, Italy on April 12, 2014. 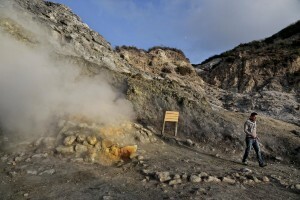 A man take a picture of fumaroles emerging from the Solfatara crater in Pozzuoli, Italy on April 12, 2014. 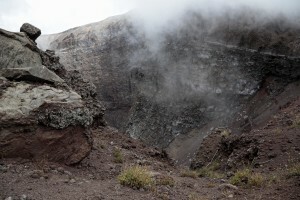 Fumaroles are volcanic steam releases that contain sulfur causing a malodour similar to addle eggs. 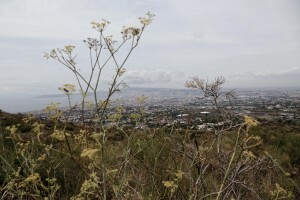 A general view on Naples city from the cone of Vesuvius volcano on September 9, 2013. 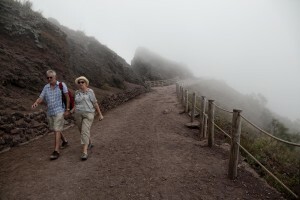 A tourist on the pedestrian path of Vesuvius cone in Naples, Italy on September 9, 2013. 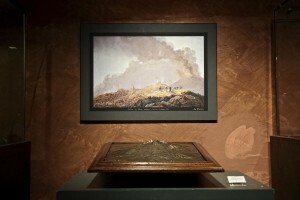 A plastic and a printing of Vesuvius volcano during the exhibition “Fire and Passion” at Museum of San Gennaro treasure Naples, Italy on January 18, 2014. 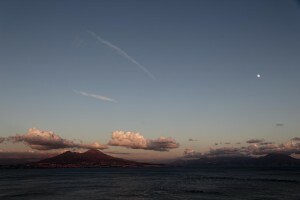 A particular of Vesuvius volcano in Naples, Italy on September 9, 2013. 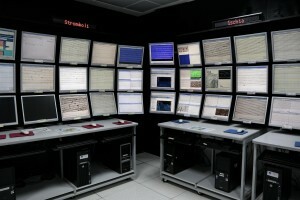 Monitor inside INGV (National Institute Geophysics and Volcanology) Osservatorio Vesuviano department which constantly monitors volcanic activity of mount Vesuvius, Campi Flegrei, Ischia island and Stromboli island in Naples, Italy on March 19, 2014. 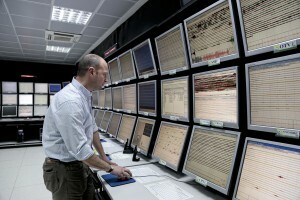 A technician inside the monitoring room of INGV (National Institute Geophysics and Volcanology) Osservatorio Vesuviano department which constantly monitors volcanic activity of mount Vesuvius, Campi Flegrei, Ischia island and Stromboli island in Naples, Italy on March 19, 2014. 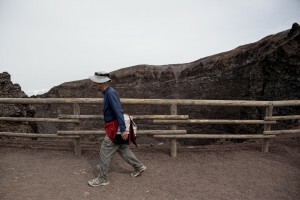 A man walks near fumaroles emerging from the Solfatara crater in Pozzuoli, Italy, on April 12, 2014. Fumaroles are volcanic steam releases that contain sulfur causing a malodour similar to addle eggs. A general view of Serapis Temple (Macellum), who represented for several centuries the most valuable and precise metric index to measure the phenomenon of bradyseism (the periodic lowering or raising of the ground level) in Pozzuoli, Italy on September 13, 2013. 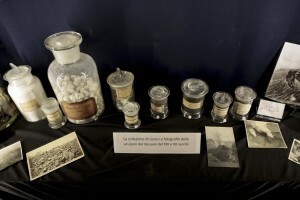 The collection of ashes and photographs of the Vesuvius eruptions in nineteenth and twentieth century during the exhibition “Fire and Passion” at Museum of San Gennaro treasure in Naples, Italy on January 18, 2014. 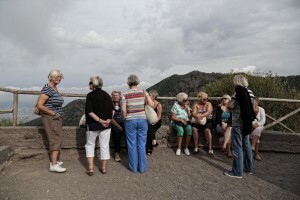 Tourists on the pedestrian path of Vesuvius cone in Naples, Italy on September 9, 2013. 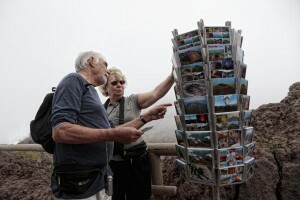 Tourists visit Vesuvius volcano in Naples, Italy on September 9, 2013. 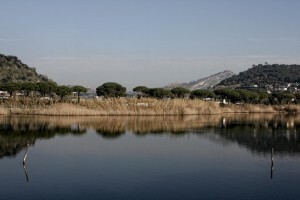 A picture of Lucrino lake, originated by damming in Pozzuoli, Italy on January 13, 2014. The Lucrino lake owes its origin to the interaction that is developed over time with the sea (lagoon origin). Today the lake has very limited extention and this is likely attributed to the morphological change of the area occurred as a result of Mount Nuovo eruption in 1538. 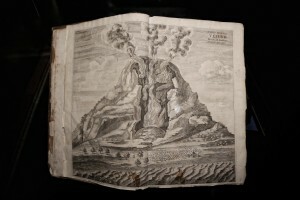 An old book with a picture of Vesuvius volcano during the exhibition “Fire and Passion” at Museum of San Gennaro treasure in Naples, Italy on January 18, 2014. A general view of Vesuvius volcano in Naples, Italy on September 9, 2013. A general view of Vesuvius volcano in Naples, Italy on September 16, 2013.